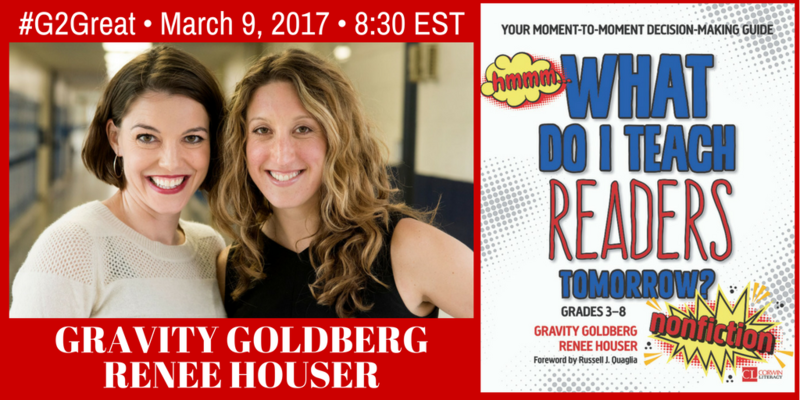 On March 23, 2017 we welcomed Jennifer Serravallo as a guest host on the #G2Great chat to talk about her most recent book, The Writing Strategies Book. The thing about this book and the sister to this book, The Reading Strategies Book (Serravallo, 2015) is that they are full of real and practical strategies that proficient readers and proficient writers use. These strategies make visible the work of proficient readers and writers so that students can begin their journey in developing independence in literacy. In creating a useful resource for teachers Jennifer takes these strategies and organizes them by goals to support student writing. It is through these goals and strategies that we can lead our students to become independent writers. Through a hierarchy of goals Jennifer provides a pathway for teachers to guide students to develop, work towards and reach specific goals. 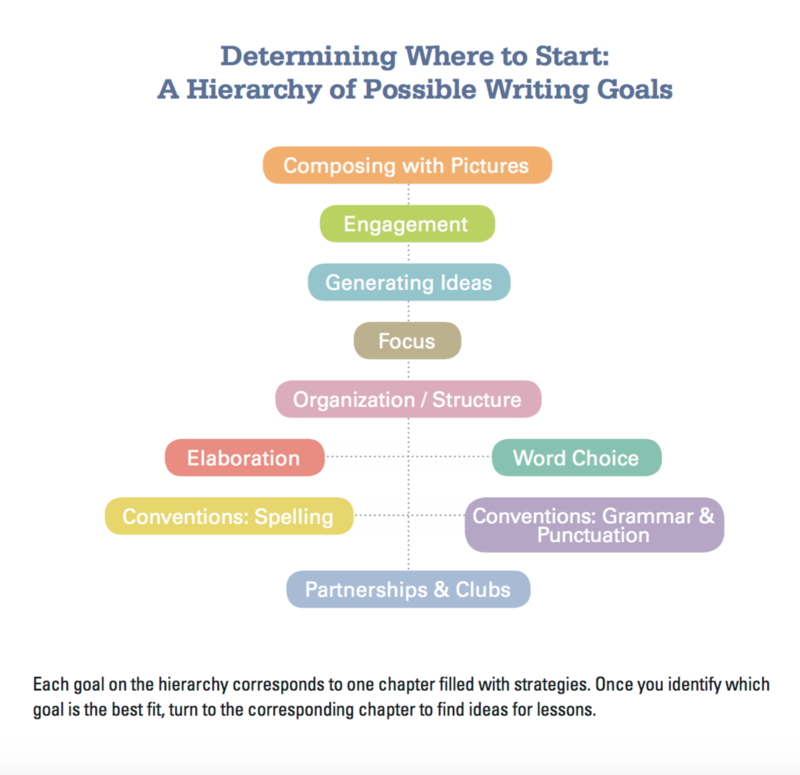 This hierarchy of goals helps teachers to decide where to begin in setting goals and teaching strategies with writers. This provides answers to what most teachers struggle with when teaching writing. It provides answers to the questions and struggles about time and focus. During the chat teachers reflected on their struggles with knowing what to focus on when it feels as though there is so much to teach and never enough time. Jennifer’s hierarchy of goal puts teachers and students on a pathway that will allow more time for practice on specifically targeted strategy within identified goals. 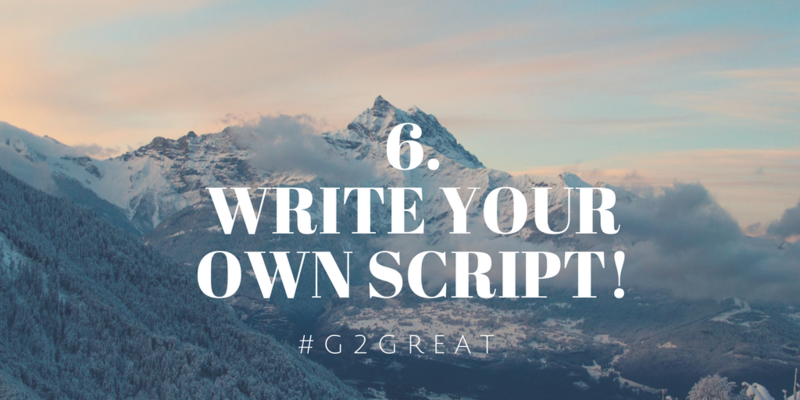 Investing time up front with students, observing as they write, meeting with them in conferences and studying their on-demand writing will allow you to know your students well enough to choose an appropriate goal. If teachers want to make the writing process visible and tangible to students then we need to share with them the strategies that writers use. Of course, writers do these things often with automaticity, however with guidance and practice in these strategies students can begin to employ strategies independently. Jennifer Serravallo has captured and organized strategies for writing in narrative, informational, opinion/persuasive and poetry. 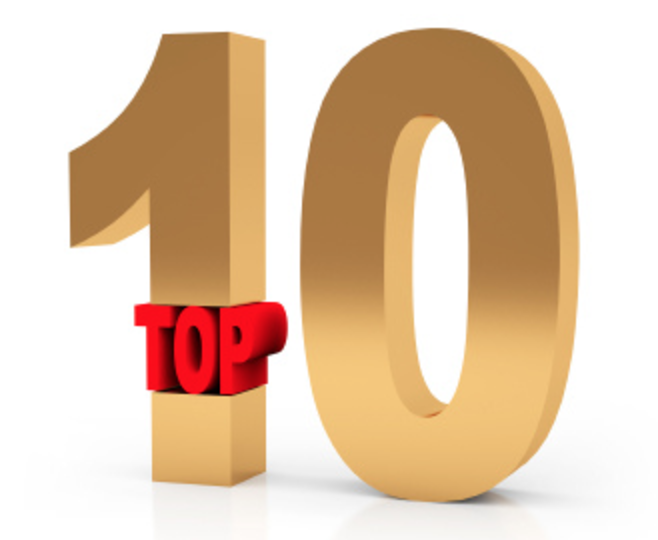 These strategies often can be utilized in more than one type of writing, during more than one stage of the writing process and across more than one grade level or developmental levels of writing. The organization of strategies by goal allows for you to carry goals across many differents types of writing or units of study and will ensure practice and ultimately transfer in writing skills. When students can transfer what they have learned to another piece of writing they are able to make decisions about what their own goals are and what strategies they need to employ in any new piece of writing they engage in. Teaching the writer rather than the one piece of writing is the way to develop independent writers. 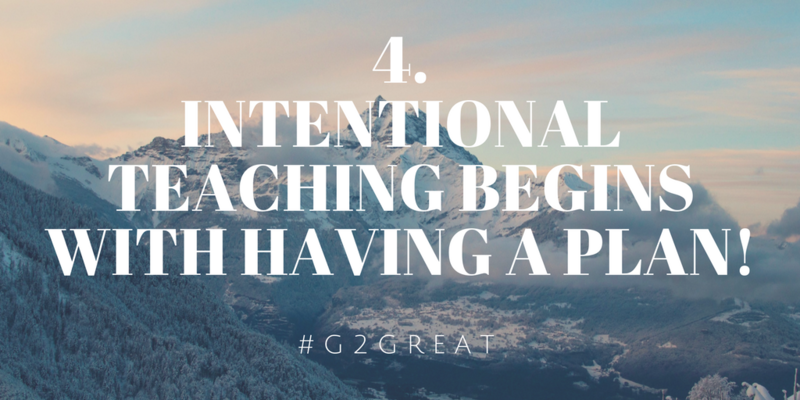 This begins with goal setting and it involves teacher feedback, self-assessment, and reflection. Our overall goal in teaching writing is to teach students to be independent writers. 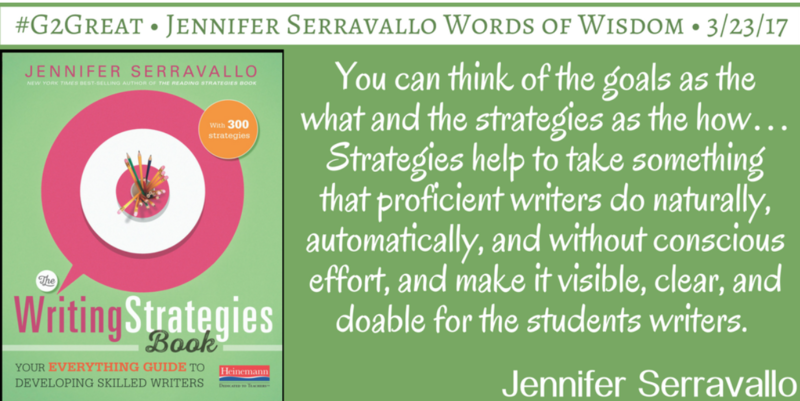 Jennifer Serravallo has created the ultimate tool in The Writing Strategies Book to support teachers and their writers as students move toward becoming proficient writers who are learning multiple strategies through the writing process as they engage in multiple units of study with opportunities to publish in many different structures. Of course, no writing process is complete without a publication and celebration. Jennifer includes an appendix in her book that is specific to the publishing and celebrating that helps writers to write with the end in mind. Always remember that writing is hard work, and it is good work, no not just good, it is GREAT work that deserves to be published and celebrated. Have you ever had an experience that was so powerful it lingered long after it was over, intermittently tapping you on the shoulder to remind you it was still there? 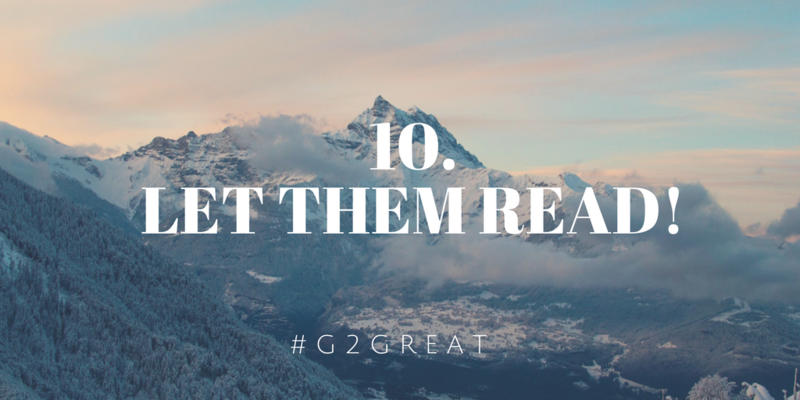 Well that happened to me November 2015, long before we brought my memory to life on #G2Great. 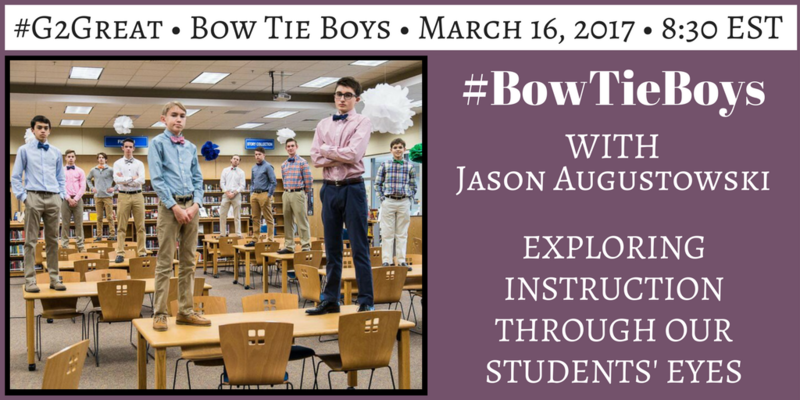 March 16, 2017 is now a contributor to the growing memory in my heart as high school teacher Jason Augustowski and nine remarkable ninth and tenth grade students known as #BowTieBoys were our guest hosts. 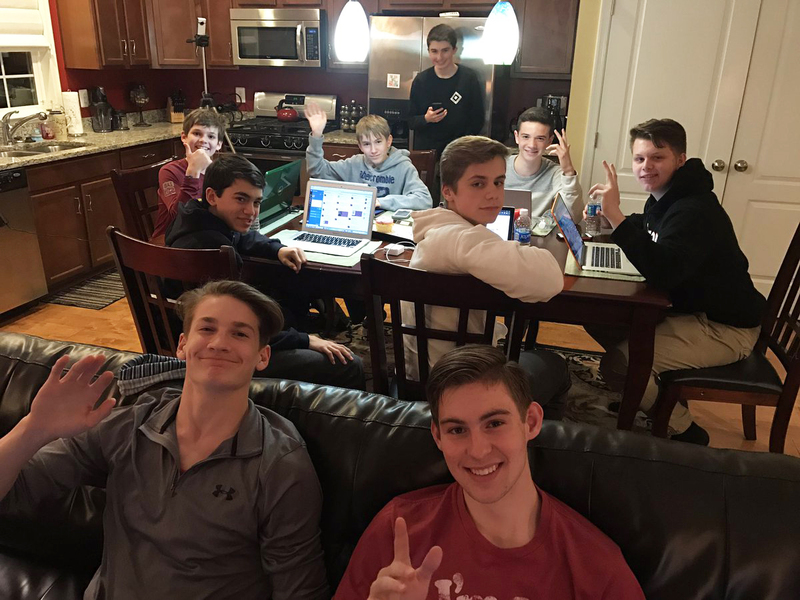 Ryan Hur, Ryan Beaver, Jack Selman, Dawson Unger, Spencer Hill, Sam Fremin, Sean Pettit, Joe O’Such, and Kellen Pluntke extended their reach across the Twittersphere. 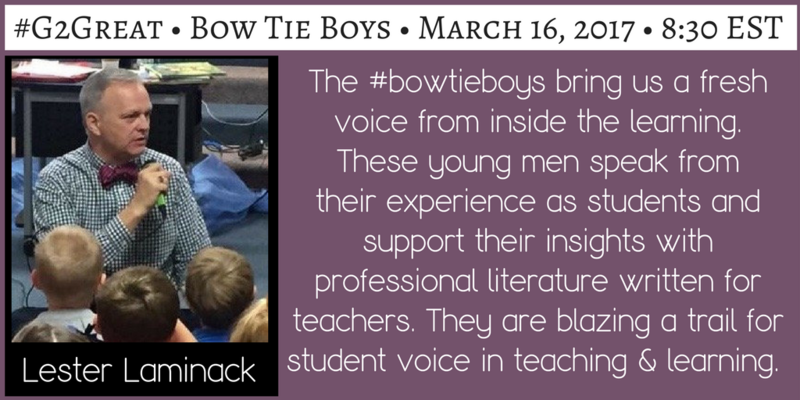 I first learned of #BowTieBoys when I happily found myself in a session at NCTE 2015 led by Lester Laminack and Jason Augustowski. Hearing high school students speak so eloquently with such profound understanding of teaching made it clear I had witnessed something spectacular. 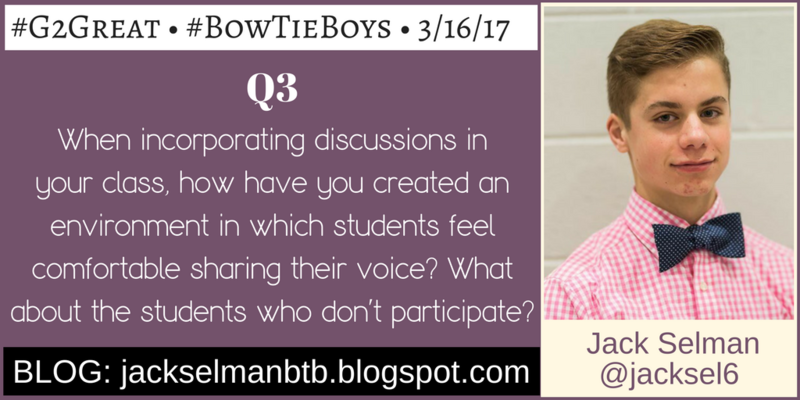 I experienced that impact once again at NCTE 2016 and was so inspired that Sam Fremin became our first #BowTieBoy guest host June 9, 2016. 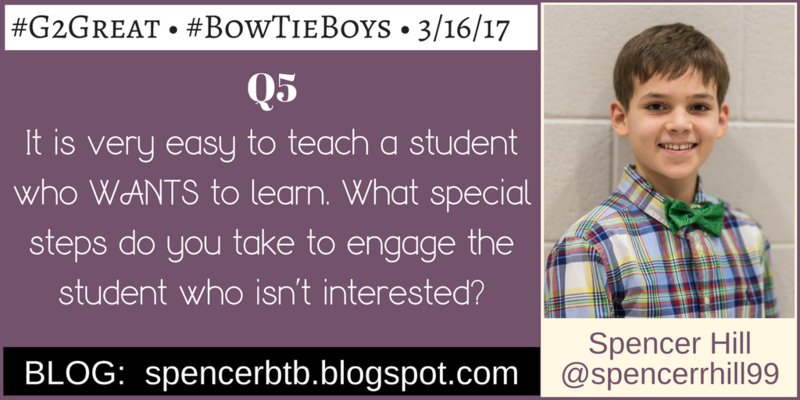 I have since become a self-appointed #BowTieBoys cheerleader, a role I take very seriously. 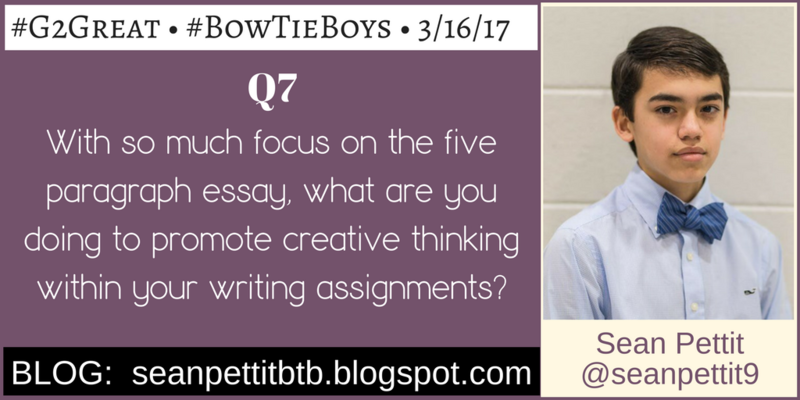 When I asked the Bow Tie Boys to host #G2Great, there wasn’t a moment of hesitation. 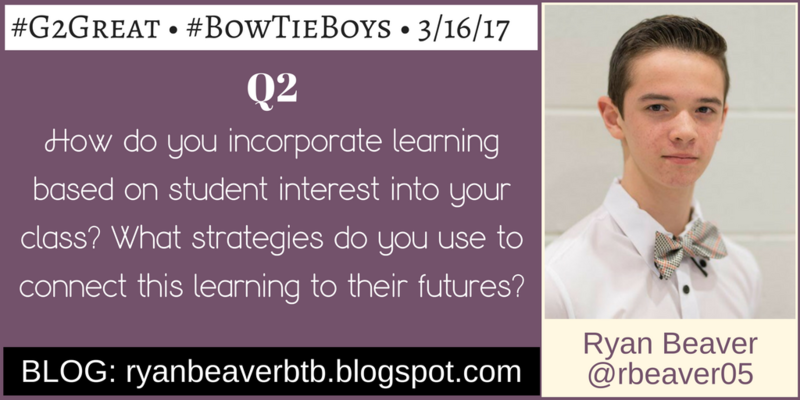 Wholeheartedly embracing the opportunity, students wrote their own questions based on personal educational interests and on chat night Jenn, Amy and I took a backseat to soak in #BowTieBoys wonder in a #G2Great version of side-by-side learning. Although this inspiring group has grown dramatically since 2015, it brought back the intense memory of our first meeting – and I was inspired anew! 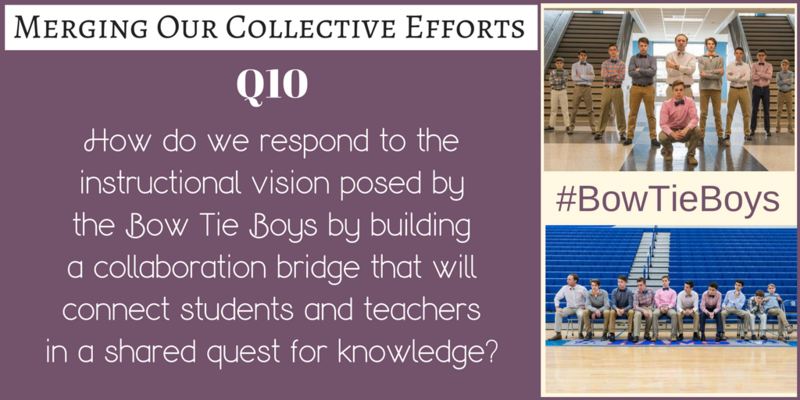 From the moment #BowTieBoys took the #G2Great helm, professional enthusiasm exploded into colorful fireworks of collective enthusiasm that persists days later. Even though this was the first experience with a Twitter chat for many of them, they approached it will a spirit of enthusiasm. That enthusiasm was captured by a picture Jason took of nine students sharing their passion for educational excellence – and we were all charmed from the start! I doubt that anyone would argue the tremendous affect personal interest can have on the learning process. 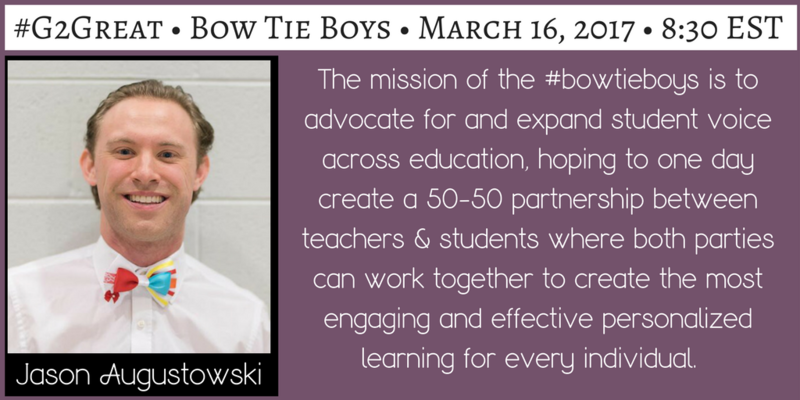 The Bow Tie Boys’ questions and blogs are fueled by their educational interests and this has resulted in incredible learning opportunities that are driven by hard work and effort. Ryan reminds us that when we celebrate interests, we can awaken curiosity that in turn leads to more learning. 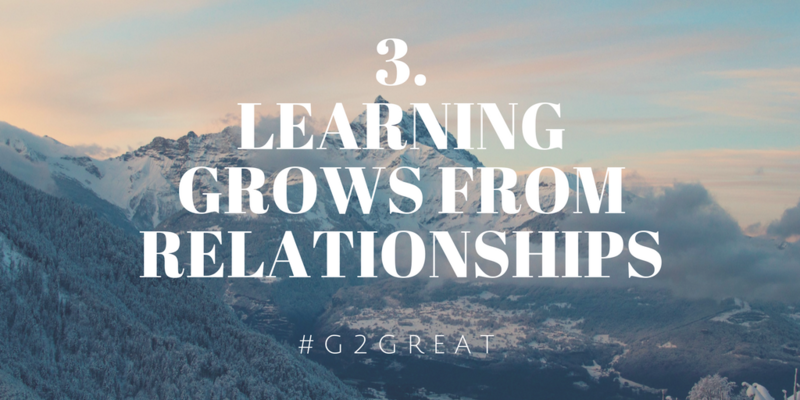 Student interests and personal passions then become ripple their way to increased learning. Research has long informed the critical role dialogue and collaboration play in the learning process. 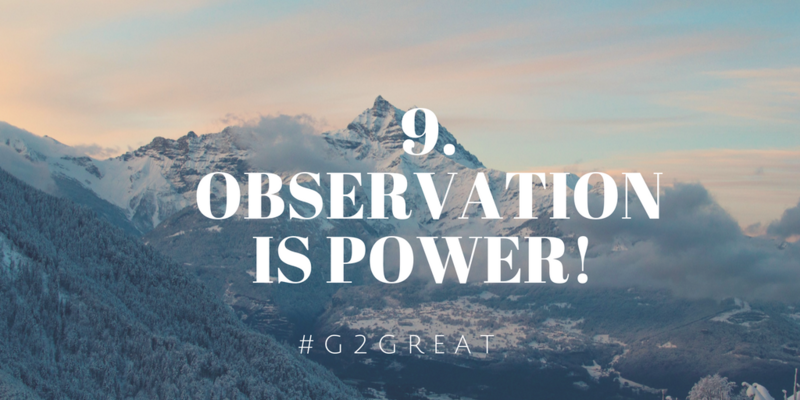 Our weekly #G2Great chat illustrates the power of talk week after week as educators clamor to join a social media form of collaborative discourse. Jack reminds us that the end product of learning is not assignments or contrived questions. Rather, the goal is to actively engaging students in the process of learning that is elevated through meaningful talk that revolved around the learning. Engaged collaboration rises from a respectful community of shared learning where talk moves from the teacher to students. 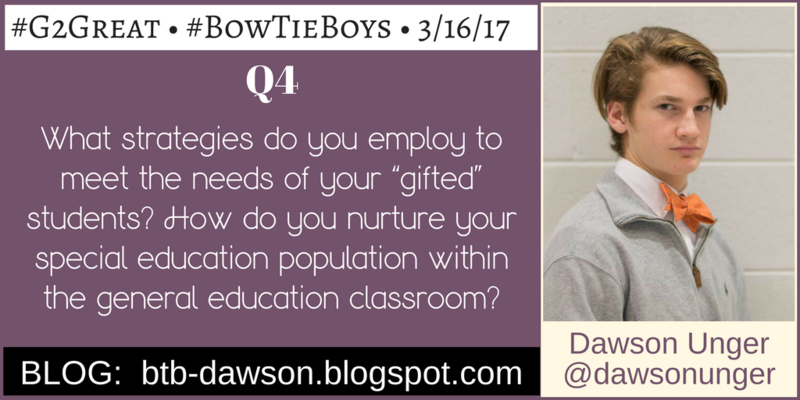 Dawson’s question focused on gifted and special education students, but his message was about so much more because it illustrates our responsibility to meet the needs of every student in our classroom. Dawson reminds us that we can only meet this ethical and professional responsibility when we truly know our students. As we gain deeper day to day knowledge that occurs only in the trenches of learning we cam then generate differentiated instructional experiences that take students from where they are to where they could be when our teaching is student-focused. Just as our students are wonderfully unique from an instructional perspective, they are also wonderfully unique in the level of engagement they each bring to learning. As we address the instructional needs of students, we also address their emotional needs. Spencer reminds us that choice and passion are extraordinary contributors to this process of maximizing student engagement in learning. There is a big difference between assigning and engaging and the impact of this distinction can be quite dramatic – for better or for worse. 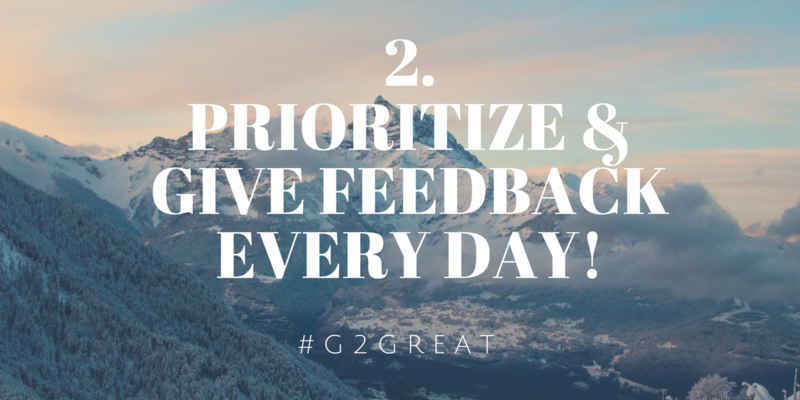 Our wonderful #G2Great family shows up on Twitter week after week, and Sam is a long-time member of that family (yes a high school student has been part of our #G2Great conversations for some time). Sam is committed to social media and the powerful role it can play on the learning lives of teachers and students alike. Yet, in spite of an escalation of technological advances and broad learning opportunities, many teachers and students still avoid it. Sam’s question is worth posing in every school, “Why limit student interaction?.” But this requires teachers to embrace it. Sean raises an issue many educators have also posed that questions the value of five-paragraph essays. Sean reminds us that when we shift our focus away from rigid rule-based writing to the creative thinking that is a critical aspect of writing, we can then increase the quality of that writing. We can achieve this important shift by designing a learning environment that encourages students to find inspiration around them. Student interest can spark the creative thinking that could teach students as much about the writing process because it is inspired by that thinking. 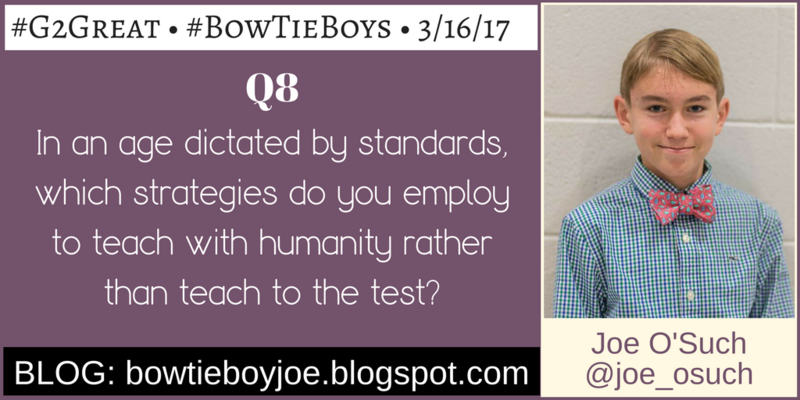 Joe’s thoughtful merging of “humanity” with teaching to the test is an important one in a day and age where test scores hover over educators like a dark cloud. Joe reminds us that student success rather than test scores is the ultimate goal. His suggestion to offer individual learning opportunities that put learning back in the hands of students allows us to keep them at the center of our practices. 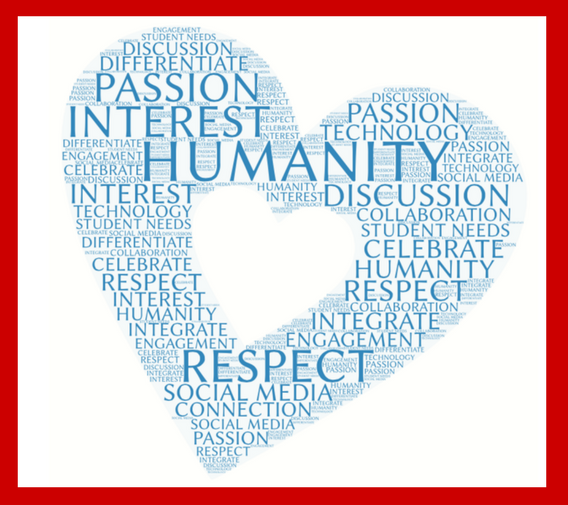 I can’t imagine a better way to achieve Joe’s belief in teaching with “humanity” than to keep professional humanity inseparably intertwined with our efforts. 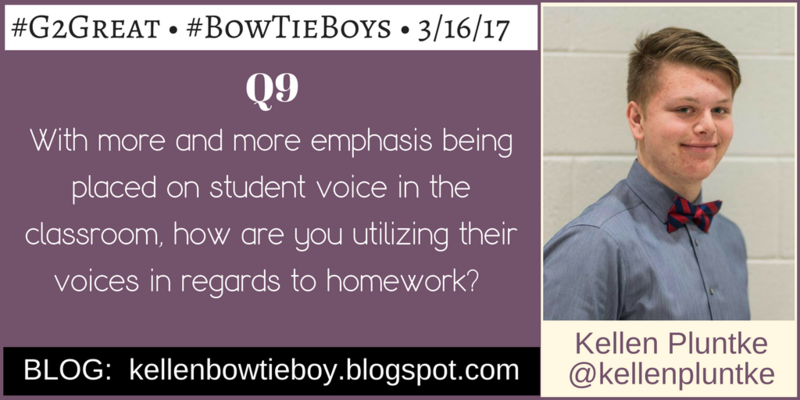 Homework has regained attention in educational discussions so Kellen’s question is a timely one. With so much time-wasting homework assigned in schools across the country, Kellen wisely reminds us to allow student voices to enter the conversation. We can elevate homework experiences when it supports and extends instruction while highlighting student passions. When purpose and passion join forces, the homework discussion changes in both direction and potential for impact. This message is sorely needed in many classrooms. 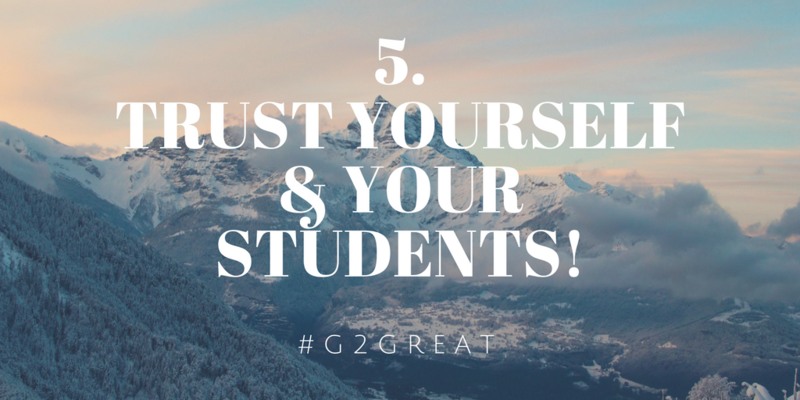 This bonus question is inspired by high school teacher Jason Augustowski (blog) who participated in the entire #G2Great chat alongside students. 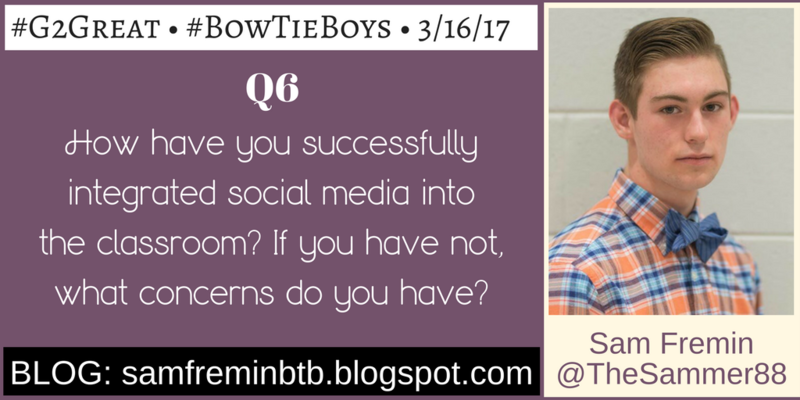 As the resident #BowTieBoy cheerleader, I’d like to pose a question in their honor. Jason is a model for what is possible when we trust students to lead the way. In Jason’s words, that begins by creating classroom where we model our unwavering commitment to students. 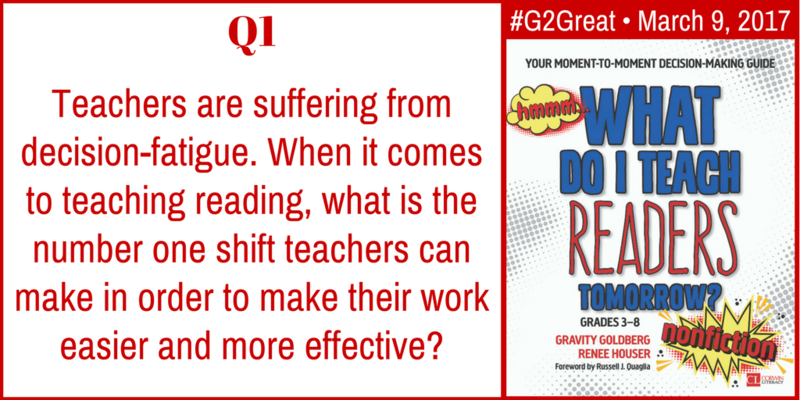 Jason was in the sidelines all the way, yet always allowing students to remain in the #G2Great drivers seat by posing and responding to their own questions. 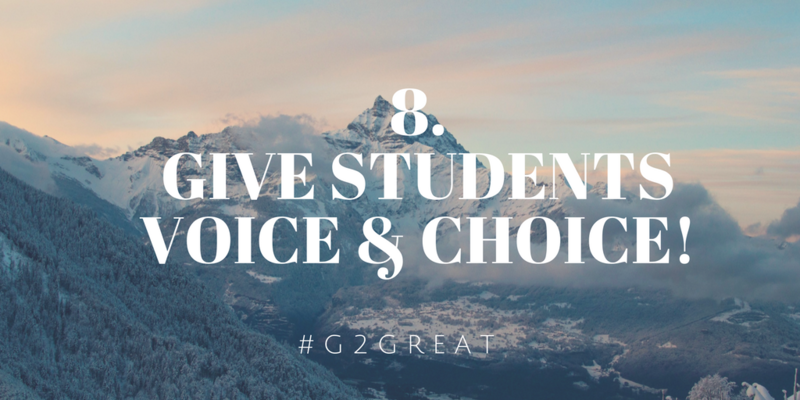 He set the stage for this amazing chat experience while keeping students in the spotlight so they would shine in a powerful side-by-side supportive journey to a powerful new experience. As I reflected on conversations that rose from these questions, I realized that certain ideas were woven throughout the tweets like an intricate instructional thread of importance. These repeated concepts inspired me to create a visual reminder of the impact nine students and a teacher had on our thinking. I’d like to end on a personal note. For several years, I’ve had a nagging concern that we’re missing the obvious in a constant quest to become the educators our students deserve. Thanks to the #BowTieBoys inspiration, I am now more convinced than ever that this missing ingredient is students. I’m not sure that we can ever become the teachers we hope to be until we open more teacher-student conversations. 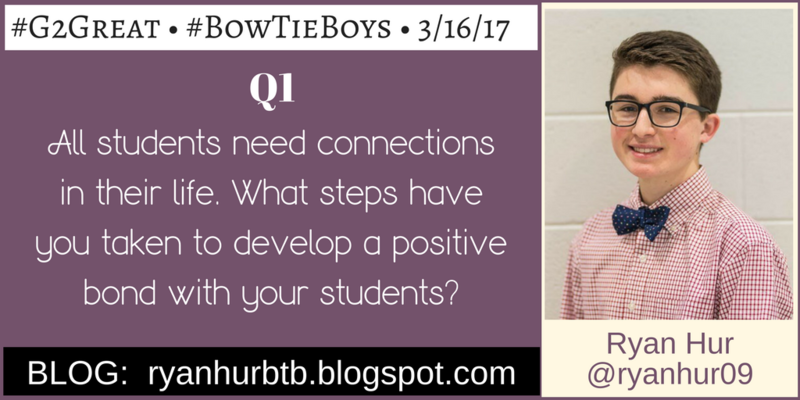 Our #G2Great family values professional growth but #BowTieBoys illustrate a new layer of our life-long quest for understanding. If we are willing to hold up a looking glass of our teaching from students’ perspective, we can see our work through their eyes. And those are very wise eyes indeed. So in honor of their continuing impact, please do me a favor. When you go back into your classrooms tomorrow, look into the eyes of your students and ask them about your teaching from their side…. because you’ll never know the wonderful places their responses can take you until you ask. 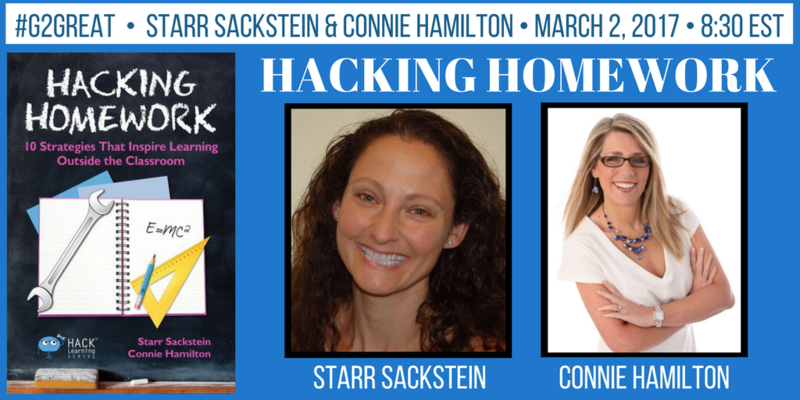 On Thursday, March 2, 2017 #G2Great welcomed Starr Sackstein and Connie Hamilton to a conversation around homework. While we had several questions to generate our conversation I can’t help but feel that some questions beg for us to linger longer. This blog is just the place to linger longer and dig a little deeper into such an important topic. Be sure to check out their book, Hacking Homework: 10 Strategies That Inspire Learning Outside the Classroom. What does the research say and why is everyone talking about it? John Hattie’s research about homework has been the evidence that many people quote when saying that there is “no research to support homework having an impact on learning.” It is in very broad terms that the research is quoted and does not differentiate the types of homework that Hattie is referring to. He breaks this down by the nature of the homework and then the effect size, while correlated to the grade level is really more connected to the type of homework that is typically assigned to students at each level. In considering this research, reading independently for homework and specifically reading at their independent reading level would have a 0.55 effect size. The effect size is the magnitude of a specific effect and Hattie found that the “hinge point” of higher than 0.40 had a positive impact on learning. Is homework relevant? This was a question that generated responses that spoke to the importance of considering the purpose when assigning homework. Just like anything else, learners need to understand the purpose behind something before they are going to engage in and learn from it. Acknowledging that there is a real purpose behind a specific homework assignment gives students reason to complete it and makes the time spent on the homework valuable. Once the purpose has been established we also need to consider the relevance of a particular homework assignment. I believe independent reading is a valuable homework assignment. When assigning independent reading I want to be very clear in the purpose of reading independently as homework. There are a variety of purposes for independent reading and they need to be expressed and demonstrated to students. Ultimately it is to become a better reader but the purpose needs to also be relevant to our students. Purpose and relevance: The purpose behind reading for homework each night is to become proficient, lifelong readers and above all thinkers. Reading impacts all aspects of our lives personally, socially and professionally. It improves the quality of our lives. We become better citizens when we read and think critically and share our ideas with others to make the world better. This is what we want for our students. We know that children learn to read by reading and they need to read a lot in school and outside of school in order to accelerate their reading proficiency. 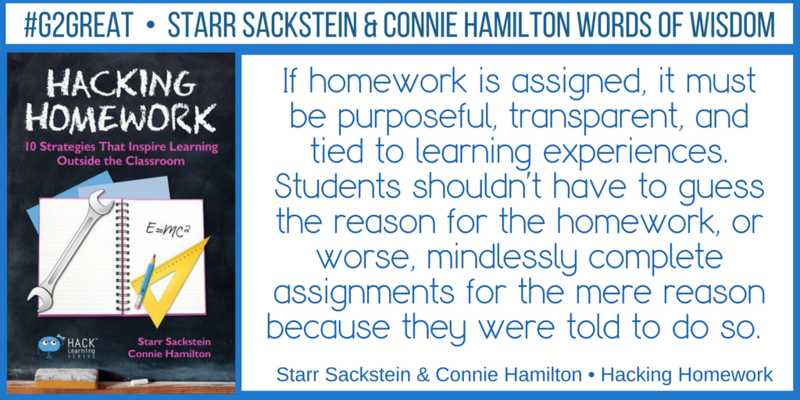 Homework needs to be meaningful and relevant to the student and their learning. Independent reading of self-selected books means that homework is purposeful and relevant. Flexibility in assigning homework is necessary for so many reasons. First, as teachers we work with little humans, and little humans well, they are just as complex as the big ones like us and that requires flexibility. We are flexible by providing learning opportunities that best meet our students’ needs and accentuates their strengths in order to accelerate learning. One size fits all or rigid rules and consequences for homework does not provide the flexibility required for our best learning to happen! 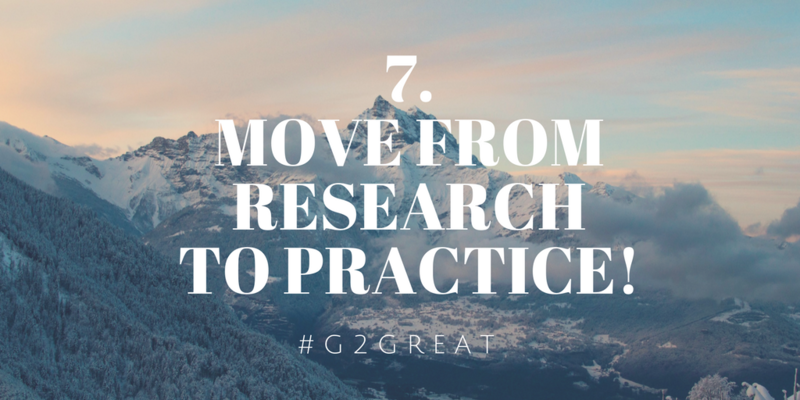 When homework is meaningful, purposeful and relevant it can be a positive experience. When we develop a vision around homework and share it with our families in very clear ways that are purposeful and relevant it will strengthen the connection and overall support improving student learning. Providing flexibility to account for individual and family differences will also help to build the connection between a student’s home and school. Ultimately, the home-school connection will improve when we look at homework truly as a way to improve and inspire student learning. Homework is a topic that warrants our attention. 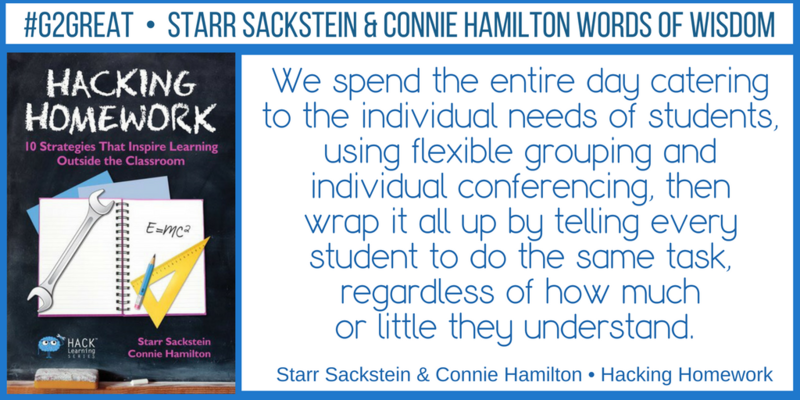 We are grateful to Starr and Connie for helping us reflect on these important ideas. Hacking Homework: Favorite Quotes, Tips, Advice from the Introduction and Hacks 1-4 by Colleen Noffsinger.